Author: Earley, Pete Set In . . .
On the night of May 19, 1985, John Walker, Jr. deposited documents containing 129 stolen naval secrets wrapped in a plastic bag at an isolated KGB dead drop near Poolesville, Maryland. Then he drove on to another designated drop point to pick up the bundle of cash, more than $200,000, that was to be his payment. There was nothing there. Disturbed, Walker went back to retrieve the plastic bag. It was gone. He reluctantly returned to his Rockville motel room, convinced he had at last been discovered by the FBI - but when there was no effort to stop or arrest him, it seemed likelier that the Russians had simply screwed up. In his nearly twenty years of treason, of spying for the USSR, this had happened twice before. But this time John Walker was wrong. When he left his room to hide the maps and photographs of the drop sites, handgun at the ready, two FBI agents leapt out at him. What The New York Times was to call "the most damaging espionage operation in American history" had been disarmed at last. Pete Earley's gripping book is shocking in its revelations. The tale of master spy John Walker, Jr. and his ring - his Navy seaman son, Michael, who had supplied that night's documents from his ship, the nuclear aircraft carrier "Nimitz"; Walker's gullible brother, Arthur; and Walker's best friend, retired naval communications specialist Jerry Whitworth - is dazzling in its detail and especially appalling in the portrait it paints of the amoral, egocentric mastermind of the ring. For two decades John Walker fed secrets absolutely crucial to America's national security to the KGB. Incredibly, for two decades, his treason remained undetected. He grew increasingly more sophisticated with time - far different from the naive Navy watch officer who, in December 1967, simply walked into the Soviet Embassy in Washington and said, "I want to sell you top secrets." But his womanizing, his free-spending lifestyle, his boat, his plane, his cars, his frequent trips to Vienna and his discordant family life were more than enough to generate suspicion. However, tips from his wife, Barbara, were repeatedly ignored by the FBI. Pete Earley conducted more than one hundred interviews for this book, including twenty-three separate interviews with John Walker, Jr., lasting an average of seven hours each. He spent several hundred hours talking with ten other members of the immediate family, and many more with the other eighty-seven people interviewed. Out of this extraordinary firsthand access, as well as essential documents, telephone transcripts and FBI files, comes this riveting story of what KGB officer Vitaly Yurchenko called "the greatest case in KGB history. We deciphered millions of your messages. If there had been a war, we would have won it." 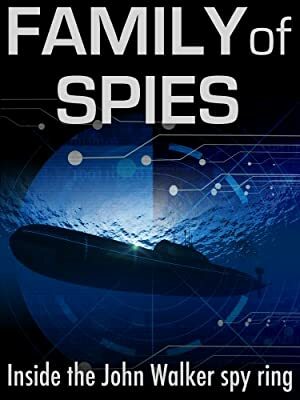 Family of Spies is as compelling as a superlative novel of international intrigue and suspense. But because it is fact, not fiction, its lessons are frightening. How could this have happened? How can we prevent it from happening again? What can we learn from John Walker's story to ensure that our nation's secrets remain inviolable in the future? ABOUT THE AUTHOR: Pete Earley is a storyteller who has penned 13 books including the New York Times bestseller The Hot House and the 2007 Pulitzer Prize finalist Crazy: A Father’s Search Through America’s Mental Health Madness.